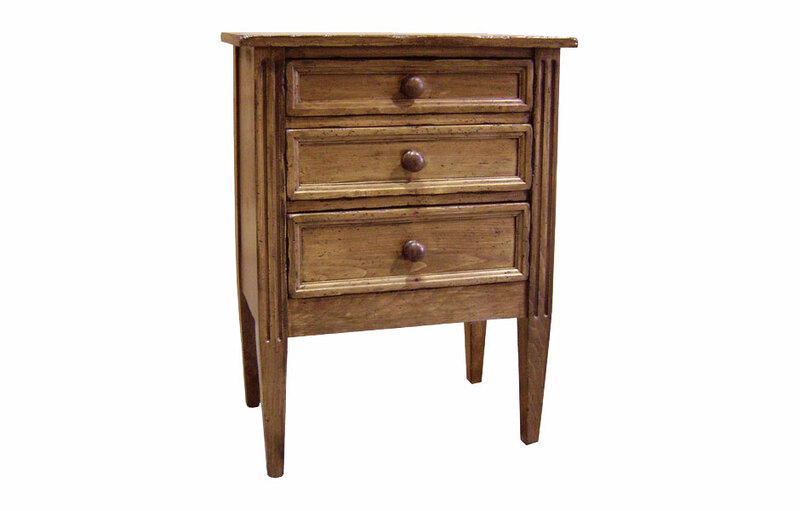 The Three Drawer Nightstand has (3) drawers each with graduating heights (small to large). 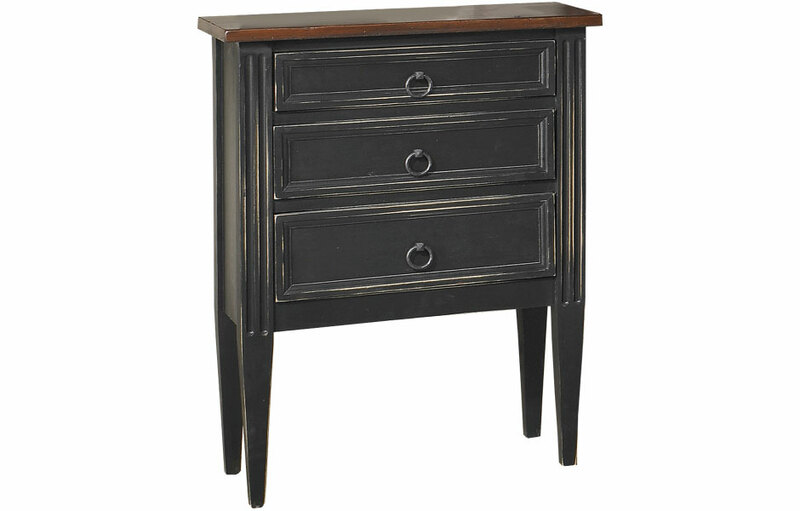 The drawers have a decorative bevel molding, and the tapered legs feature a fluted detailing on the two front legs. The pulls are iron rings and add a unique french-style look to this piece. Use as a bedroom nightstand or as an end table in the living room. 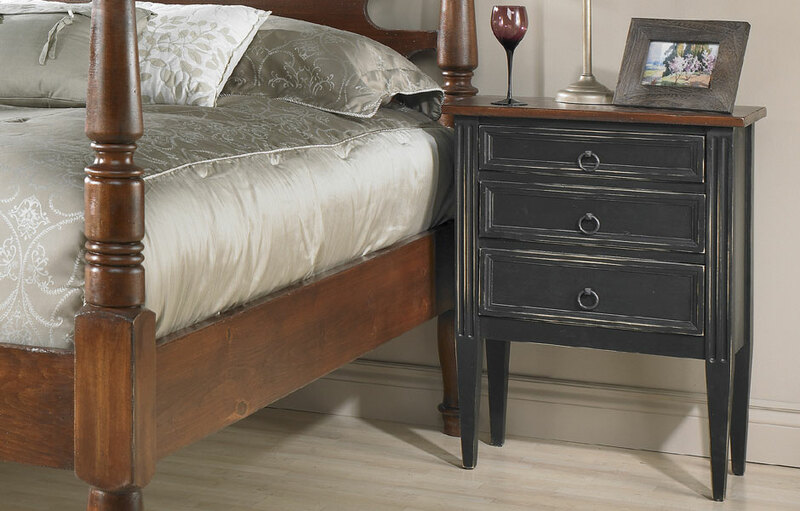 The Parisian Three Drawer Nightstand is an elegant and stylish bedside table. The tall, narrow profile of the piece makes it ideal for any bedside, or occasional table space. The solid wood end table is a 32" high to complement a high bed or high armed sofa. The occasional table has (3) drawers each with graduating heights (small to large). The drawers have a decorative bevel molding adding elegance to the piece. The tapered legs feature a fluted detailing on the two front legs adding traditional style to the small table. The iron ring pulls complete the french-style of the end table. The tall, 14" deep end table is perfect for a bedroom nightstand or as an occasional table in any living space. Top is water-sealed to prevent water rings, for daily use. Each end table is hand finished in any of our milk paint colors or stains for a classic country French effect. All of our finishes are hand applied giving each table a handcrafted quality. Our finishers then lightly rub the paint, if desired, for a slightly worn appearance. The Parisian End Table has tapered legs and simple embellishments making it a versatile occasional table to add to a variety of room styles including french country, farmhouse, English cottage, rustic, traditional, or transitional. 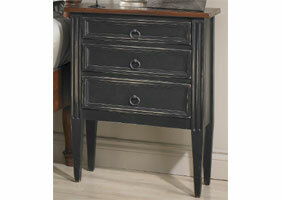 Three Drawer Nightstand painted Black.